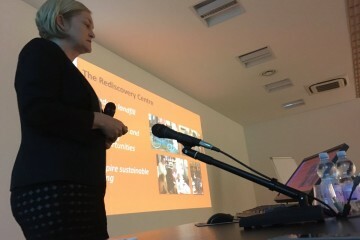 Rediscovery Centre CEO & WISER Project Manager, Sarah Miller was invited to present at the EU Life Platform Meeting on waste management and the circular economy in Milan in June. The seminar commenced with a warm welcome by Dario Sciunnach (DG Environment, Energy and Sustainable development) which was followed by policy updates from Christian Strasser (EC DG ENV), and Julius Willem Langendorff (waste unit, EC/DG ENV). As the retrofit of the Boiler House is the ultimate creative reuse challenge, Sarah spoke about how it embodies the concept of the circular economy. She explained how it will be a prototype 3-D textbook designed with education in mind regarding every aspect of the project, from the very foundation of reusing the Boiler House itself to the sensory garden that will be perched atop the old reservoir. By combining the built, natural, and cultural environments, the WISER Life project aims to show how these different elements can be combined to enhance the educational potential for a sustainably-focused space that teaches and reinforces the principles of the circular economy. Other European projects presented at the conference included GtoG, CRESIM, ReBus, LIFE REVAWASTE, ClosedLoopCarpet and 3XEnvironment.